I have seen what the power of proper nutrition can do for patients with both dry and wet age related macular degeneration. If an optometrist or ophthalmologist will take the time to discuss in detail life style changes , proper dietary intake and proper supplementation, we would see much less vision loss from macular degeneration. I see some patients respond almost miraculously when they follow the specific steps I outline for them. The key is to make them understand the serious nature of the disease and how macular degeneration can lead to permanent vision impairment . Some patients will follow my guidelines and do quite well by stabilizing the disease or even gaining some valuable vision back. However some patients will continue to decline even while following the latest protocol and even receiving the most up to date treatments from a retinal specialist. This is what I do all day long, deal with macular degeneration patients ! I have done a variety of blood tests, omega index tests and DNA tests to develop the protocol and supplements I recommend for my patients with macular degeneration. When patients follow this protocol often times not only will their ocular health improve but their overall health will improve too! God made a pretty good body and once the proper fuel is given amazing things can happen. Doctors from all over the world are using dietary modifications, introduction of nutritional supplements and lifestyle changes to aid the patient with macular degeneration. Optometrists and ophthalmologists can utilize intracellular and plasma blood testing, genetic testing and advanced retinal imaging to help determine if a patient may have modifiable risk factors for macular degeneration. Some of these modifiable risk factors include specific genes, elevated c-reactive protein, elevated cholesterol, elevated triglycerides, elevated homocysteine, lipofuscin pigment accumulation and nutritional deficiencies. All macular degeneration patients need to have a DNA test done to see how aggressive their macular degeneration may be and to find out if zinc is needed for their retinal health or of if zinc is actually detrimental to their retinal health. There is new science that indicates a percent of patients with ARMD may be harmed by zinc and a percent may be helped with zinc. The only way to know is to have a DNA test done . The following 17 step outline I have developed to decrease the risk of having progressive visual loss from macular degeneration. This list was compiled based on solid scientific evidence reported in related literature and from positive results I have seen clinically in several very large macular degeneration practices. This does not replace a comprehensive dilated eye examination by an optometrist or ophthalmologist. The key is early detection! New forms of retinal imaging like Annidis RHA and OCT technology allow doctors to detect macular degeneration much earlier and initiate appropriate defensive measures early. Organic Gluten Free Paleo Diet . Eat more free range turkey, free range chicken, free range eggs, cold water fish, Goat milk, Goat cheese and grass-fed beef. Prepare without deep-frying, broiling, grilling or baking! This traditional type of cooking elevates the temperature in the meat too much causing glycation of the protein and the fat. This glycated meat is consumed and can prematurely age the body disrupting DNA and causing inflammation in the body and also increasing the risk of certain cancers. So cooking in a perfect world would consist of boiling, stewing, steaming and poaching. Vegetables can be gently sautéed in organic coconut oil on very low heat. Eat more fish (omega-3) but be careful when eating fish because many large fish have toxic levels of mercury, lead and PCBs (PCBs are persistent organic pollutants, banned since 1977, that entered the environment through both original use and later disposal). Eat cold water fish (sardines, tuna, mackerel, lake trout, Atlantic halibut, herring and wild–not farmed–salmon). Try to avoid farm raised fish and instead eat wild fish especially wild Alaskan salmon. Wild salmon are high in a super carotenoid called astaxanthin that is proving to be a key nutrient in the nutritional approach for macular degeneration. A lean organically raised GRASS FED steak in moderation is a good source of protein, Vitamin B complex, zinc, iron, folate, magnesium, selenium and omega-3 essential fatty acids. Omega-6 fats predominate in commercially raised (corn-fed) meat, poultry, dairy and eggs; and also in margarine, and vegetable oils (such as corn, peanut, canola, safflower, soybean, sunflower, and grape seed oils). Omega-6 increases inflammation in the body! Olive oil is an omega-9 and is beneficial; it should be the primary bottled oil in the kitchen for use in cooking and salad dressings. Organic Virgin Coconut oil is also a very good oil to use for cooking because of the healthy medium chain triglycerides and lauric acid found in this oil. The typical American diet provides 10-20 times more omega-6 than omega-3, but a healthier ratio is 3:1 or 4:1! Cut back on your omega-6 (choosing healthy omega-6 foods like nuts, seeds, and avocado) and increase omega-3. 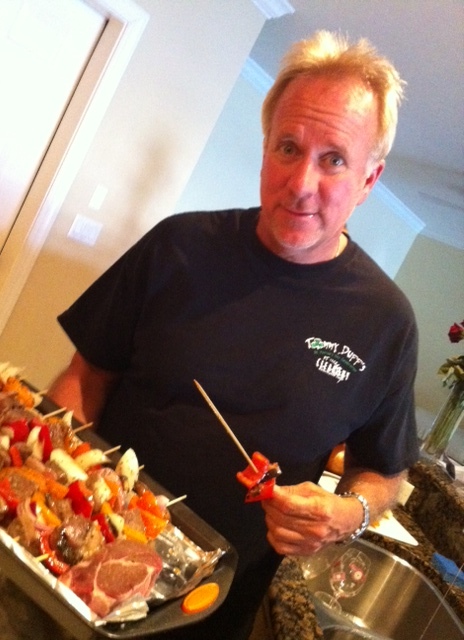 I have come to the conclusion that the Paleo (Hunter Gatherer) type of diet is best for all of my patients. This is consuming foods that are natural to the earth and are not processed. A combination of a Gluten free, Mediterranean and Paleo diet is also very healthful for the eyes and total body. I recommend staying away from gluten because most foods containing gluten like wheat , barley and rye are genetically modified and may have much higher levels of pesticide residue that can be toxic to your health. I have found a company called paleo simplified that makes very good raw paleo bars that are filled with nutrients that are very good for the retina , brain and entire body. Paleo Simplified energy bars can be bought at many wellness and healthy grocery stores as well as online. These are great to have in between meals. 2. Consume more dark green leafy vegetables like baby spinach, baby kale, collards and swiss chard (preferably organically grown) . I preach to avoid any of the fruits and vegetables that are listed in the “dirty dozen” unless they are organically grown do to their toxic levels of pesticides that are found inside. Carefully boil, steam or simmer these in extra virgin olive oil or coconut oil. Gentle cooking helps to break down the cell wall releasing the bio-availability of the greens. Juicing is also a good way of getting these nutrients. Lutein is abundant in dark green leafy vegetables and has been shown to potentially help slow down the devastating properties of macular degeneration. Lutein and its related compound zeaxanthin are highly concentrated in the macula, providing a yellow color known as the macular pigment (MP).The macular pigment acts like a built-in sun screen and protects the macula from the damaging photo-oxidative effects of blue light. Eating more foods that contain lutein/ zeaxanthin and/or taking a supplement of lutein along with zeaxanthin daily will help replenish the macula pigment density that you are more prone to lose as you age with macular degeneration. Fortifeye has developed a supplement containing all three of the beneficial carotenoids: lutein, zeaxanthin and astaxanthin in one vegie gel cap called Fortifeye Focus. https://www.fortifeye.com/products/fortifeye-focus/ . Fortifeye Focus for kids will be available in August 2015. It is crucial for children to get these valuable nutrients they are missing especially since they spend many hrs in front of digital applications that are emitting harmful blue light between 400-430 nm. . These will come in a delicious non gmo/ organic chewie for kids or adults that can’t swallow pills. If you are taking a blood thinner like Coumadin, consult with your physician prior to eating more dark green leafy vegetables. If you want to maximize the absorption of a spinach salad then put a hard-boiled egg in the salad, the phospholipids in the egg yolk will help the carotenoids absorb and the yolk is also a good source of additional lutein. Using a spice called turmeric on your food is a good way at getting both anti-oxidant and anti-inflammatory properties added to the meal. sprinkling a little black pepper with the turmeric is a good way to increase the absorption of the turmeric. 3. Eat more orange bell peppers and Goji Berries (preferably organically grown), gently cooked or raw. Orange bell peppers are very high in zeaxanthin. Scientists believe this nutrient when combined with lutein helps filter out dangerous HEV light (blue light) and may help maintain macular health. Sauté spinach and orange bell peppers together in coconut oil or steam them for good macular health. Goji berries are also one of nature’s most powerful antioxidants that has a very high concentration of zeaxanthin. Goji berry is one of the richest edible plant sources known for zeaxanthin content. Up to 77% of total carotenoids present in goji berry exist as zeaxanthin. Both goji berry and zeaxanthin also may prove to be helpful in the irregular blood vessel growth and leakage that occurs in the wet form of macular degeneration due to their potential anti-VEGF properties. This means that these nutrients may have the ability to sop irregular blood vessels from growing and leaking in the retina. 6. Eat less salt. Research may indicate that decreasing salt intake may decrease deposition of waste products in the macula called drusen. Reduction in salt intake may help decrease blood pressure and fluid retention. Use pink sea salt or Celtic sea salt when necessary. Try using more turmeric and black pepper as seasoning. 8. NO SMOKING! If you do smoke try to quit. Smoking lowers your serum antioxidant levels in your blood and thus causes a nutritional deficiency at the cellular level. Second hand smoke is just as bad. Smokers increase their risk dramatically of developing the more advanced stages of macular degeneration. Smoking increases C-reactive protein (inflammatory marker in blood that is a risk factor for macular degeneration). If you smoke be sure you do NOT take high levels of the supplement called beta-carotene. High dosages of beta-carotene my increase ones risk of lung cancer. New science also indicates beta-carotene may interfere with the absorption of lutein (a beneficial carotenoid for macular health). Beta-carotene should not be in a vitamin formula especially if you have macular degeneration. Most Americans that eat some animal protein will not be deficient in Vitamin A and thus don’t need any beta-carotene. Beta-carotene has shown some form of competitive inhibition against lutein due to binding sites that beta carotene attach to on lutein in the liver not allowing it to absorb into the blood. Fortifeye Vitamins are all Vitamin a and beta carotene free!! 9. Do cardiovascular exercises for 20-30 minutes 5 times a week (discuss this with your physician first). Research indicates that patients who did cardiovascular exercise (treadmill, stationary bike, elliptical, walking, jogging, swimming etc.) were less likely to develop macular degeneration. These forms of exercise may be beneficial for glaucoma patients as well. The improvement in circulation from cardiovascular exercise combined with proper diet and proper supplementation is very powerful at promoting good ocular and overall health. This cardiovascular exercise can also lower intra ocular pressure in the eye and help to decrease the chances of the eye developing glaucoma. This decreased intra ocular pressure will also help to improve circulation to all parts of the eye. 10. If you are overweight, LOSE WEIGHT! Overweight people are twice as likely to develop macular degeneration. Losing weight will also reduce C-reactive protein and help to normalize cholesterol and triglycerides. Controlling C-reactive, cholesterol and triglycerides may benefit macular degeneration. Overweight patients are also more likely to develop glaucoma and cataracts at an earlier age. Reducing your caloric intake and increasing your cardiovascular exercise will aid in weight reduction. Patients who are over weight with pre-existing health conditions may want to seek help from a physician supervised weight loss program. 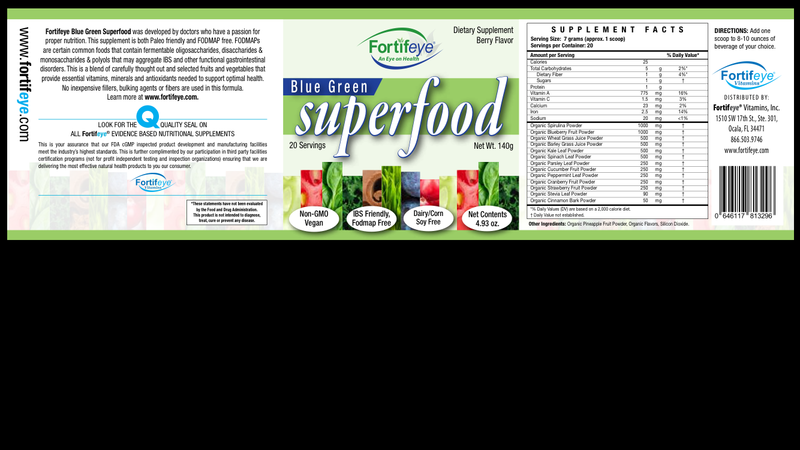 Fortifeye Vitamins is in the developmental phases of a new meal replacement system that is derived from all organically grown fruits and vegetables called Fortifeye Organic Blue Green Superfood that will be available in October 2015. Dr Michael Lange along with Fortifeye Vitamins has also been developing a non gmo , non denatured whey protein concentrate from New Zealand grass-fed A2 cows that when mixed with the Fortifeye Organic Blue Green Superfood will be a complete meal and aid in weight reduction. 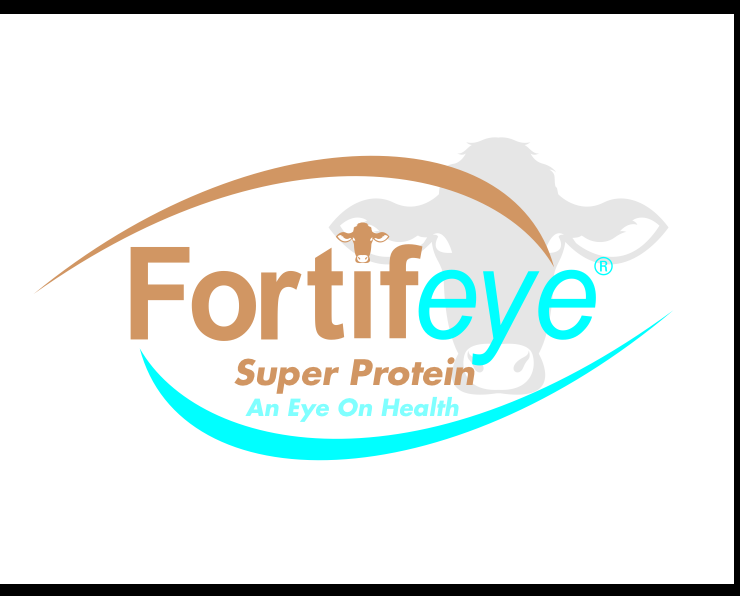 this product will be called Fortifeye Super Protein and will also be available in September 2015. A good non denatured whey protein concentrate is one of the best ways to stimulate Glutathione in our bodies master antioxidant! Glutathione levels start to drop at age 40 and when these levels become reduced aging becomes more rapid. So stimulating glutathione with Non denatured whey protein concentrate is one step in the right direction of anti aging. Also this type of protein stimulates muscle growth , muscle retention and fat loss! One of the biggest deficiencies my macular degeneration patients have when tested with intracellular blood tests is Glutathione. Fortifeye Super Protein can be used by diabetics and people on low carb diets. 11. Control systemic health problems such as Hypertension, Diabetes, elevated Cholesterol, elevated C-Reactive protein and elevated homocysteine. Elevated Homocysteine has been linked to Macular degeneration as well as Optic Neuropathies, Certain Types of Glaucoma, retinal occlusive disease and diabetic retinopathy. Patients that are overweight can have a dramatic improvement in these systemic health problems once they start a weight management program and stick to it. The combination of a gluten-free organic paleo diet, weight management, exercise, proper sleep, hydration and taking the correct supplements is one of the best ways at controlling systemic health problems. Patients that are not able to follow this type of anti aging lifestyle will potentially need to be on medications and followed by their physician carefully . 13. Have a vitamin D3 blood test; 25 (OH) D done routinely, making sure you are not deficient in Vitamin D3. Recent research shows patients with low levels of serum Vitamin D may be more likely to develop macular degeneration. Your vitamin D3 levels should be between 60-90 for maximum benefits. Vitamin D is a potent steroid hormone and deficiencies are linked to cancer, cardiovascular disease, stroke, hypertension, diabetes, osteoarthritis, osteoporosis, depression, multiple sclerosis, muscle wasting, schizophrenia and even the flu. The sun is the best source of Vitamin D. Just 15-20 minutes of sun exposure during the peak hours in shorts and a tank top while wearing a good pair of blue blocking sunglasses and a wide-brimmed hat may be beneficial. After sun exposure do not wash body using any soap for six to eight hrs. The soap will wash away the oils that are allowing the vitamin D absorption. These 20 minutes of sun would be without sunscreen! Larger and more darkly pigmented people may need 30 – 40 minutes of sun to get the necessary amount of Vitamin D. Consult with your physician before too much sun exposure especially if there is a history of skin cancers or melanoma. 15. Have your DNA checked and Do not take supplemental beta-carotene vitamin A or high dose Zinc! Many emerging and published studies are proving that supplemental beta-carotene blocks the absorption of lutein. Beta-carotene also increases the risk of lung cancer among smokers and is not good for the prostate. There is no beta-carotene in the eye, however, there is a high percent of lutein concentrated in the macula, so macular degeneration patients do not want to block this valuable carotenoid. Do not take Vitamin A palmitate as studies now indicate that it blocks the absorption of Vitamin D and it may increase the risk of macular degeneration and it may also increase the risk of osteoporosis, liver problems and neuro degenerative diseases. If you are deficient in Vitamin A then a physician needs to determine why and treat accordingly. Fortifeye has cut the zinc significantly in all of their products and also has a zinc free product. High dosages of zinc have been associated with urinary tract problems, Neuro degeneration and increased risk of prostate cancer. A new study was published in 9/13 proving that certain patients with specific genes that have macular degeneration may benefit from antioxidants with no zinc! Fortifeye Zinc Free Macular Defense is now available for those that have had their DNA tested and fall in this category. It is crucial to have your DNA tested if you have Macular Degeneration in order to find out is you need zinc or if zinc is causing harm? 17. Take a good nutritional supplement based on the latest scientific data, preferably one that does not have any artificial dyes and synthetic nutrients. Be careful of supplements that have only “window dressing” amounts of specific nutrients. Many vitamin companies will add tiny amounts of popular nutrients just to be able to put it on the label. These small amounts may have no nutritional value. Patients must also be extremely careful not to take too many supplements as well. Vitamins can build up toxic levels, especially the fat soluble forms. The leading company that takes all of the current science into consideration in the development of their nutraceuticals is Fortifeye® Vitamins. The Fortifeye™ products are all natural with no dyes. They provide therapeutic levels of nutrients and no window dressing. The Fortifeye Vitamins mission is stated as promoting proper vision and whole body health with the right ingredients at the right levels. I recommend to all of my patients the multivitamin Fortifeye™ Complete Plus, which is a combination of vitamins, minerals, phytonutrients, enzymes, whole foods and omega-3 essential fatty acids designed to lay a strong foundation for eye and total body health. If the patient has macular degeneration, smokes, is over weight or is an extreme athlete, I recommend Fortifeye™ Complete Macular Defense which is a nutritional system developed to help support ocular and whole body health and give the additional antioxidants necessary for smokers, macular degeneration and extreme athletes. I have developed Zinc Free Macular Defense for patients that have tested their DNA and it shows that they would benefit from no zinc. I also recommend the Zinc Free Macular Defense to patients that have prostate problems, Neuro-degenerative issues and urinary tract problems that have ARMD. 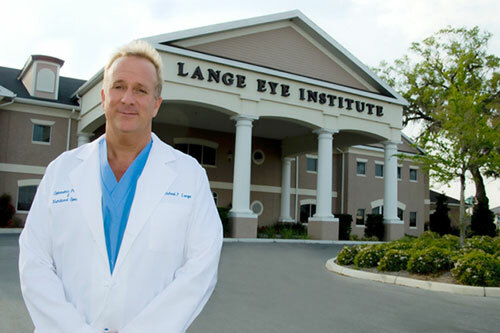 I also recommend all of my patients take a supplement called Fortifeye Focus. This supplement at one per day dosing gives 6mg of astaxanthin along with additional lutein and zeaxanthin that are all three crucial for retinal health. The hottest science and reason for taking Fortifeye Focus is to absorb the harmful blue light. Children should be taking the all new Fortifeye Focus Chewie once a day to protect their retinas at an early age from the detrimental effects of blue light they are exposed to daily. I have seen many patients in clinical practice improve, some quite dramatically, while taking these supplements. Many doctors throughout the country are now recommending Fortifeye™ Vitamins to their patients with macular degeneration. 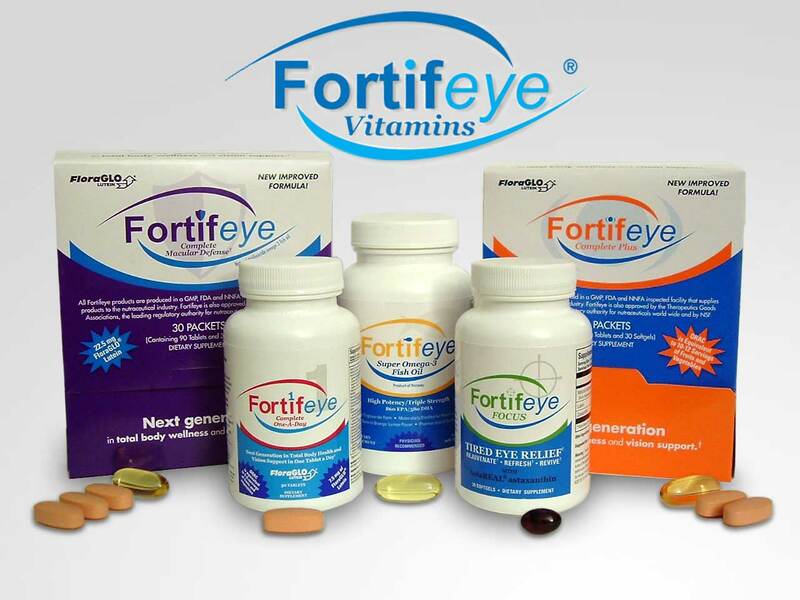 Fortifeye stays abreast of the most current science in regards to nutritional supplementation for the eye and body, and because of this, their vitamins for macular degeneration and total body health are constantly evolving. Fortifeye has multiple levels of supplements for patients based on weight, age, disease entity and DNA. For the latest information call toll-free 1 866 503 9746. Board Certified Optometric Physician and Certified Nutriton Specialist.